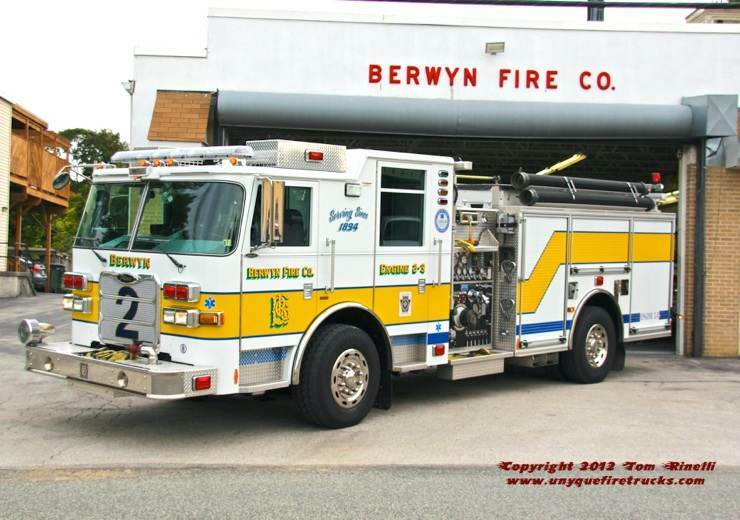 Organized in 1894 with the motto “Danger from fire prompts unified action”, Berwyn provides Fire, Rescue & ALS level EMS transport to a 14 square mile area encompassing Treddyfrin & Easttown Townships. 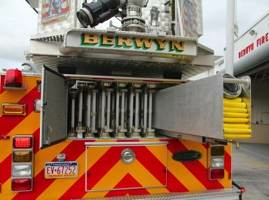 With combination staffing of 65 volunteers & 10 career paramedic/firefighters, Berwyn answers an average of 2,800 alarms annually (2,000 EMS and 800 fire). Engine 2-2 - 2007 Pierce Enforcer 1500 gpm/750 gal. Operating as a rescue engine, it features a 15kw PTO generator & four 750 watt quartz lights (one front & rear, two telescoping). 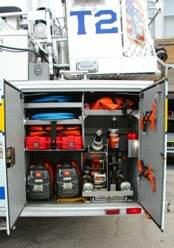 It is equipped with 6 SCBA with spare cylinders, thermal imager, a multi-gas meter, 50’ of ground ladders, a complete set of Holmatro Core extrication tools (spreader, cutter, combi tool & rams), cribbing, BLS medical gear including an AED and spill control supplies. 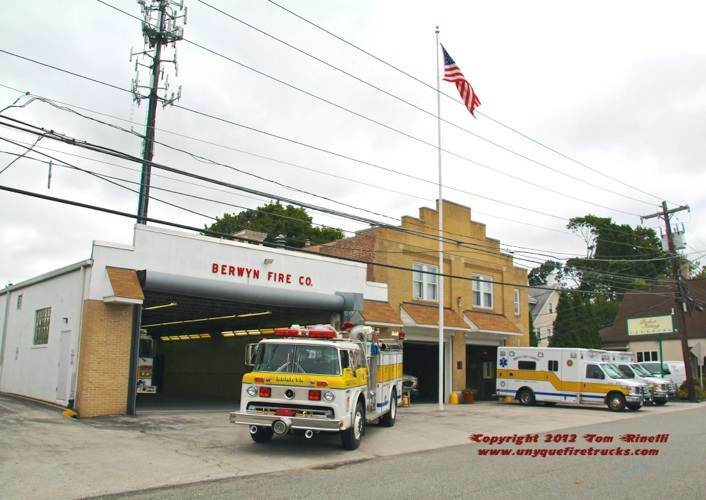 The present firehouse was built in 1929 with a double wide, double deep bay added in the 1970’s which has had the bay door enlarged several times. It features a bell relocated from the original fire house as well as a second floor apartment that formerly housed the “Upper Main Line Fire Board” dispatchers and is used present day for housing the career medics. 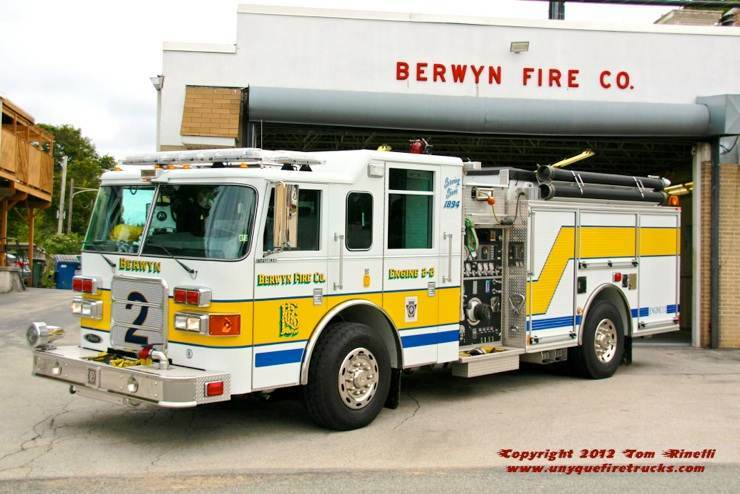 Special thanks to Chief Engineer David Warlick for the invitation to visit Berwyn and his assistance in positioning the apparatus & providing background information on the dept. Engine 2-3 - 2009 Pierce Arrow XT 1500 gpm/750 gal. 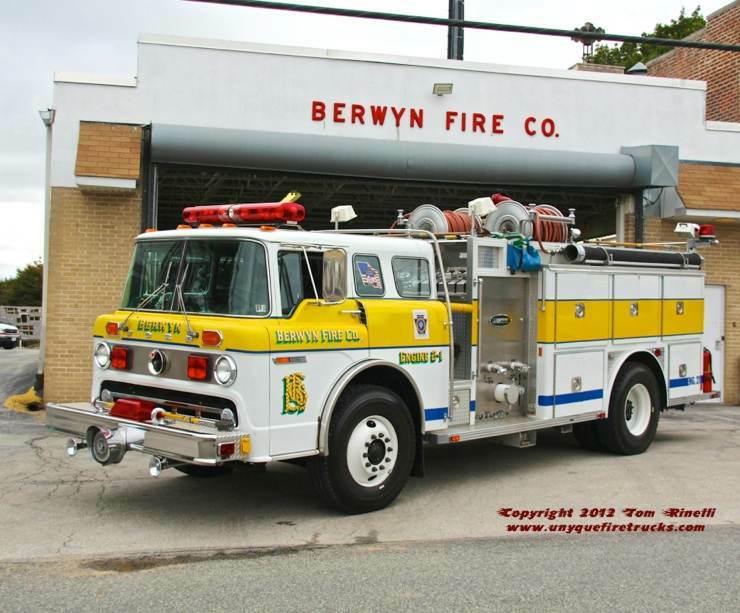 Berwyn Fire Co. holds a “unyque” distinction in that their former Engine 2-0, a 1996 Emergency One Hush engine was the first paramedic equipped engine in the Commonwealth of Pennsylvania (a surprising fact considering the number of career FD’s in Pennsylvania, particularly the City of Philadelphia which operates multiple paramedic units). Replaced in 2009 with this engine which also is equipped with full ALS medical gear, it features a 15kw PTO generator, four 750 watt quartz lights (one front & rear, two telescoping), multi-agency & tri-county radios and automatic snow chains. 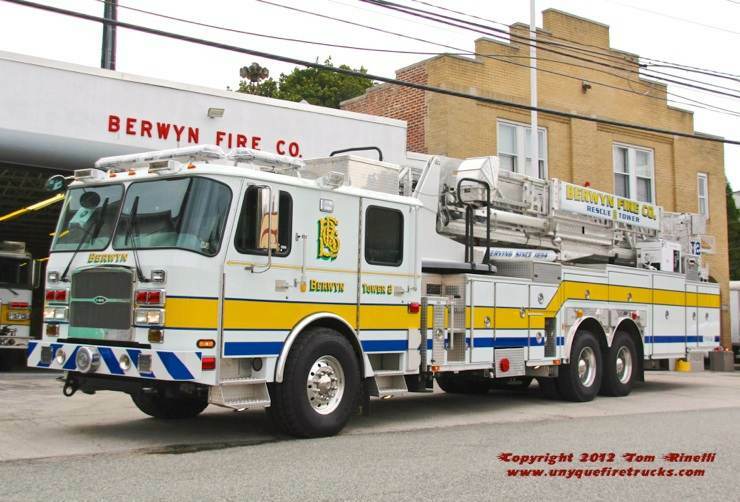 It is equipped with six SCBA with spare cylinders, two 200’ 1-3/4” pre-connects, a 250’ 2-1/2” leader line with a wye to 100’ of 1-3/4” attack line, a 100’ 1-3/4” high rise pack, 1,000’ of 5” LDH supply line and a Holmatro combi-tool with power unit. Operating as the primary RIT vehicle, this rig replaced both a 1990 Emergency One 95’ rear mount tower & a 1990 Ford “C”/Emergency One heavy rescue. It features a 15kw Smart Power PTO generator, eight 750 watt quartz lights (two front cab, two side, four on bucket) and two 250’ electric lines with junction boxes. It is equipped with six SCBA with 45 & 60 minute spare cylinders, a 100’ 1-3/4” high rise hose pack, PPV fan, 224’ of ground ladders, high angle rescue gear, water rescue gear (helmets/PFD’s/rope), a Stokes basket, assorted cribbing (including 6x6’s), a full set of Holmatro Core extrication tools (32” spreader, O-cutter, combi-tool, two rams & two power units), airbags, hi-lift jacks, a battering ram, thermal imager, electrical current detector, multi-gas meter & BLS medical gear. Engine 2-1 - 1983 Ford C-8000/Emergency One 1250 gpm/750 gal. This rig was donated to the West (TX) VFD in May 2013 after they lost an engine in a fertilizer plant explosion which killed several of their members. It features dual high side compartments, a 15kw generator, four telescoping 750 watt quartz lights and two booster reels. This custom roll-out tray holds 200’ of 5” LDH supply line allowing the tower to be self sufficient when flowing water without losing ladder storage. Extrication tools are organized in the same lay out on both the tower & rescue engine in an effort to promote ease of operation. 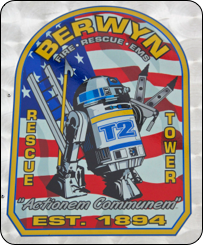 Replacing the functions of Rescue 2 (R2) & the former Tower 2 (T2), Berwyn created this “unyque” patch featuring “R2T2”.